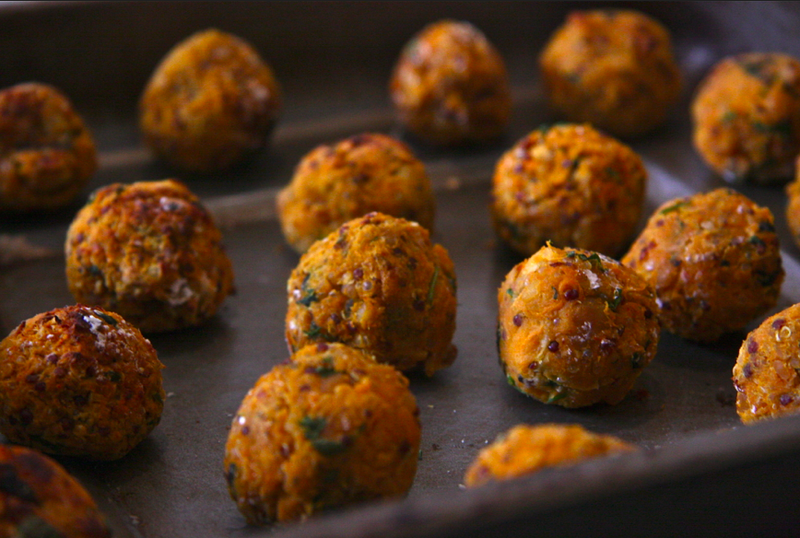 These snack sized falafel balls are perfect to make in advance ready for that moment you get hungry. Quinoa is a fantastic wheat-free alternative as well as a complete protein source, containing nine essential amino acids. A great post- work out snack to grab out the fridge. Peel the sweet potatoes and cut into large chunks, then steam for around 30 minutes until cooked and soft. If the quinoa isn’t already cooked, you can also boil and cook the quinoa now – this should take 20 minutes. Put the chickpeas in boiling hot water for 10 minutes to soften. Once the sweet potatoes are cooked, you can start heating the oil and ginger, garlic and chilli paste in a large pan.Let this cook on low heat for a minute before adding the chickpeas, quinoa and sweet potato pieces. Now add the salt, turmeric, chilli powder and coriander and mix thoroughly. Mash together and then squeeze the lime. Let this cool for 10-15 minutes or until you can touch and roll into balls. Make the balls by rolling together between the palms. Place the balls on a baking tray and let them cook under the grill for around 10 minutes until slightly brown, turning them if necessary. Recipe from Mira Manek @ http://www.miramanek.com/blog/.